you have ever read or received? 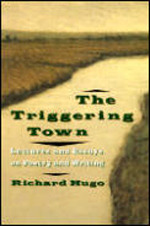 "Specifically, I like the idea about the triggering subject giving way to the true subject of the poem," notes Campbell. "A mix of spiritual, practical and inspirational, this book helped me find my way into a sustainable writing practice," says Cohen. "I hosted a gathering of college poets to meet Joshua Beckman, a wild-eyed young poet who wrote 20-page poems," explains Hill. "One student asked Joshua if he ever had times he didn’t write while he waited for inspiration. He made the greatest reply I ever heard: I have found that writing is the best way . . . to wait!" "Write about what is uniquely yours and out of that world which only you can create, stake out your territory," advises Thalman. "Written for screenwriters, so differences need to be kept in mind, but still the best I've seen for novelists as well," says Maloy. "Very detailed and specific about every body part of a story — space/time, premise, key structural steps, character, moral argument, and much more. Excellent writing (or just thinking) exercises." I hope these books and ideas ignite your creative life. Have I missed any of your favorites? Let me know!